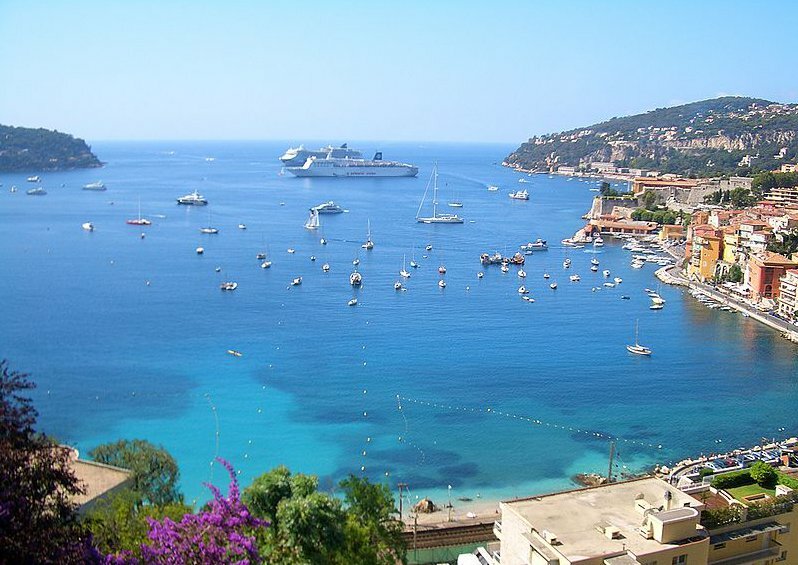 It's hard to be jaded on the Côte d'Azur. 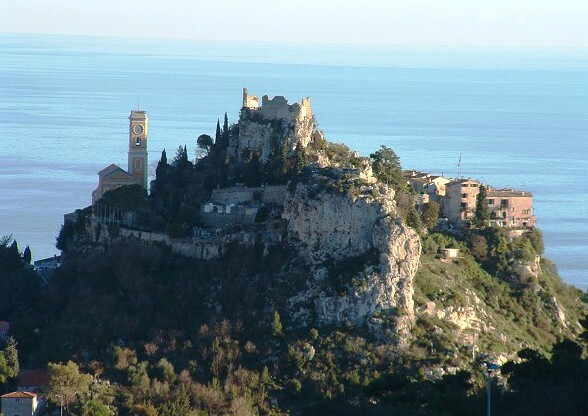 If you think you've seen everything just take a drive along the coast between Nice and the Italian frontier. And when you do, take either the Moyenne Corniche or, if your wife let's you, take the Grande Corniche above. 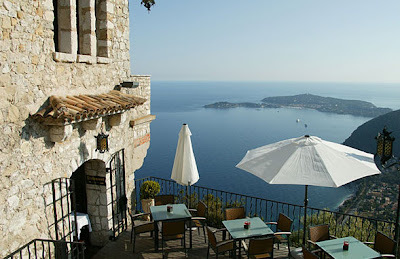 If you've seen them a thousand times the views are still spectacular, even on hazy days like we had yesterday on our outing to Eze and Sainte Agnes. 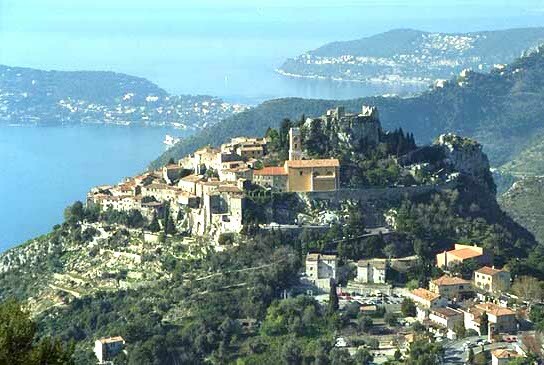 Our first stop, Eze, is an adorable village perché set approximately 429 meters above the sea and although it exists today mainly as a tourist destination, it is well worth a visit. 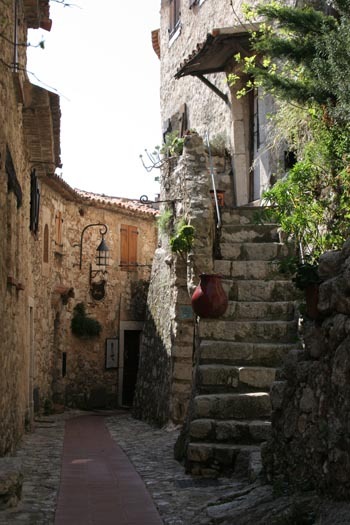 With its narrow labyrinthe streets, incomparable views and tiny houses juxtapositioned on the rocky outcroppings, it is one of the most precious little towns you can visit on the Riviera. So cute you think you are in a movie set, and indeed, Hitchcock choose to shoot here with Grace Kelly and Cary Grant. Two points if you can guess which film. 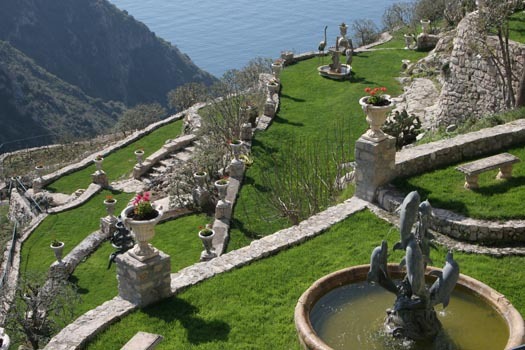 There are also two superb hotels (4 and 5 star) if you feel like being pampered. 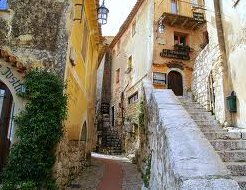 Traces of human occupation of the village go back to the Iron Age and the first buildings on the site were probably built around 2000 B.C. And with all the dangers in the world you can understand how attractive its defensive setting would be. But even its seemingly impregnable heights did not protect the residents. The village was invaded several times and the overlords changed often through the centuries. Finally the residents voted in 1860 to join France. Being slightly mischievous I decided to take a smaller back road for the passage between Eze and our next stop, Sainte Agnes - a small village resting above the coastal town of Menton and the last stop before Italy. For some reason Arlette (who REALLY doesn't like narrow roads and precipitous heights) didn't appreciate my decision. 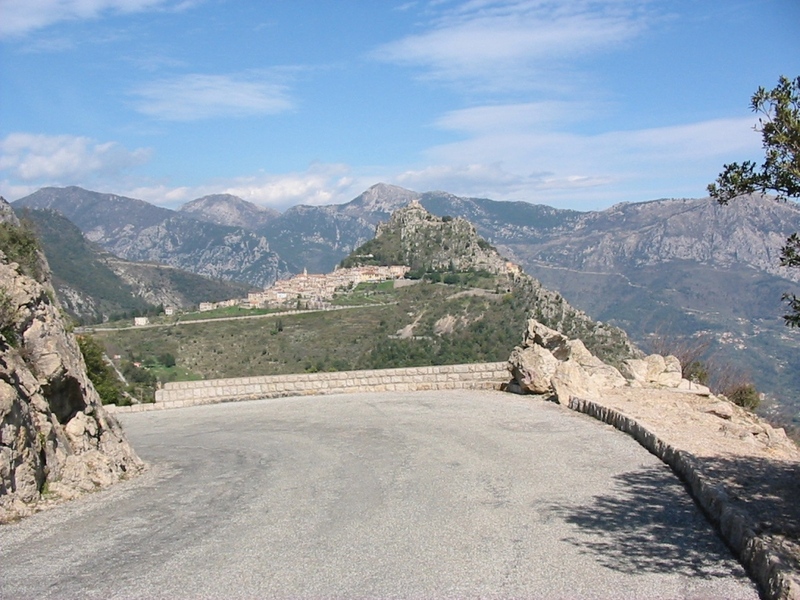 Click on the picture to enlarge it, Sainte Agnès is in the background. Instead of a guard rail the authorities kindly placed a small border of stones along the edge of the road - I guess to not spoil the view. Thoughtful. 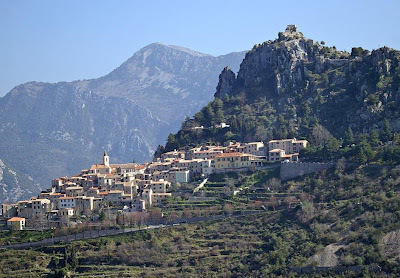 But we did meet some locals who seemed to handle the heights with aplomb. Oh no, I'm sorry, but the answer we were looking for was "La Main au collet". Ten down and on to Kitty Carlise. My problem was I was using a rural southwestern french accent which Google didn't recognise, what a rigged contest. yours truely Archibald.